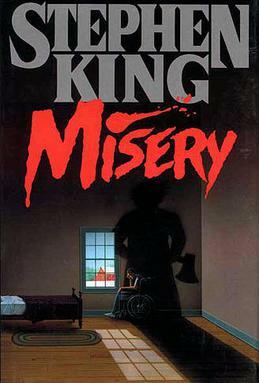 Loosely sandwiched in between two novels with truly enormous casts – It and The Tommyknockers – King’s 1987 Misery was a stripped-to-the-bone two-hander. Yes, there really are only two people featured over the 350-odd pages. One is writer Paul Sheldon — famous for his money-spinning bodice-rippers starring heroine Misery Chastain. The other is his isolated, psychotic ‘number one fan’ Annie Wilkes — famous for keeping a pig called Misery and about to inflict countless examples of misery on Paul. When Annie pulls the writer out of his wrecked car after a drunken smash on a deserted Colorado sweep of road, it doesn’t take him long to realise that he is in big, big trouble. Annie is dangerously unstable, has quickly addicted him to painkillers and is forcing him to write a brand new Misery Chastain novel just for her eyes only. We do meet the characters from his novel, but they are like beings seen through gauze, as his increasingly precarious existence begins to shape how the story is going. The only other human beings are cops who are seen briefly on the periphery; and his agent gets a couple of lines off-stage, as it were. And yet despite our focus being kept firmly on Paul and Annie, the reader is never bored. It’s impossible not to think that many of the writer’s thoughts reflect King’s own. And of course he has said that Paul’s battle with pills mirrors his own fight with drugs and alcohol. But there is also Paul’s dissatisfaction with being known as an adequate writer of commercial bestsellers whilst hankering to be taken a bit more seriously by the notoriously elitist and up-their-own-asses critical community. And one of the great ironies of Misery is that despite the…eh, unusual conditions under which it is being written, Paul’s new novel is turning out to be his very best. Personally – and speaking as an ageing hack who still (just about) holds dreams of twilight-year success – I don’t know that Annie Wilkes standing over me with an axe, an electric kitchen knife and a blowtorch would get my creative juices flowing any better; but Paul is obviously wired differently. The book is a straight psychological thriller, staying away from King’s usual forays into the supernatural (although Annie’s house is close to the ruins of the Overlook Hotel from The Shining); but this doesn’t stop Annie from being one of his most terrifying creations, not least because of her unpredictability. “That’s what I call my place upcountry. My Laughing Place. Remember how I said I was coming back from Sidewinder when I found you? … Well, that was a fib. I was really coming back from my Laughing Place. It has a sign over the door that says that. ANNIE’S LAUGHING PLACE, it says. Sometimes I do laugh when I go there. Because James Caan and Kathy Bates are so damned good in the film version (directed by Rob Reiner) their faces often intrude on a scene in the book; yet it doesn’t take from the enjoyment. I had forgotten, however, how uncompromising King was in – unlike the film – making no attempt to ‘open it out’. If you’ve never read this author before and are intimidated by the sheer volume of his work – and the size of the volumes – Misery isn’t a bad place to start.